Join WITI today and receive one of these Inspiring Books! I had a rough wake-up call last month. As the principal of a small consulting firm, it's the worst kind of wake up call - one that hits your bank account. I must admit, I now see we got complacent during the five years of boom economy. Dare I even say we got lazy, which seems obviously wrong in our current economy? We were relying on the impersonal but effective and efficient means of email and voicemail to manage our client relationships. We became slaves to convenience and electronic means of interaction, instead of taking the time and flights to see our clients face to face. Save the Date for WITI's 2005 Silicon Valley Conference! Plan now to attend WITI's 2005 Silicon Valley Conference, December 8th & 9th at the Doubletree Hotel in San Jose, California! This event will feature the 10th Anniversary Gala for the WITI Hall of Fame. For more information, please visit www.witi.com/sv/. For sponsorship and exhibiting information, please contact the WITI office at (800) 334-9484 or (818) 788-9484. Thinking about your prospects for landing that new job? You should think first about what your former boss and other references will say about you. There is no doubt, for many job searchers, a person's past will have a direct bearing on his or her future. No matter what the nature of the job or pay scale, you should take your references very seriously. They can make or break a hiring decision. Everyone is talking about blogging these days and many businesses are evaluating its potential and merits for executive communications. Should a CEO blog? Yes, if it will address a specific business need, has a clear focus and target audience. No, if it is created for an imprecise purpose, such as helping employees "get acquainted" with their CEO. Tricia, as a WITI Member, submitted this article to WITI for publication. Do you have expertise to share? WITI gladly accepts submissions for publication! For more information or to make a submission, please visit the Members' Area. Develop an action plan for leveraging their talents to be both successful and happy. For more information, please visit www.leapsofthought.com. 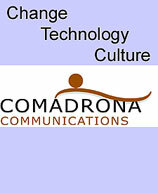 Featured Business: COMADRONA Communications, Inc.
COMADRONA Communications, Inc. is a change communication company that helps convert companies into learning organizations. We are the original developers of The DNA of Change(TM) resources, including DOC Organizational Learning Series (TM). We focus on organizational learning around technology, change and culture. We build the collaborative communication capacities that organizations need to navigate change. COMADRONA delivers change communication products and services that translate the promise of organizational objectives into the execution that will deliver on those promises. Our services help activate human networks, to ensure that technology networks pay dividends. Services include change management, organizational learning and development, and communication project management. COMADRONA Communications Inc., brings classically trained, socially informed, technologically fluent communicators to organizations that want to learn how to activate their communication networks - to realize their tactical and strategic objectives. 2005 Serious Games Summit D.C.
Join the leaders and experts shaping the emerging field of non-entertainment games at the Serious Games Summit D.C., October 31-November 1, 2005. See how learning theory and game technology come together to create interactive solutions for shared challenges. Visit seriousgamessummit.com for information, and to register! Register with Priority Code TEENXX before 9/21/05 for best pricing. Oracle cordially invites you to attend Oracle OpenWorld, Oracle's premier global business and technology conference. OpenWorld is dedicated to providing a complete picture of Oracle's products and technologies, and now that Oracle OpenWorld and PeopleSoft Connect have merged into a single event, Oracle OpenWorld 2005 will offer more than ever before. Oracle has reserved a limited number of Exhibition Hall Plus Passes that include an added bonus - access to one FREE conference session: http://www.oracle.com/go/?&Src=3674892&Act=414. We hope you will take advantage of this very special offer, which is not available to the general public. Contact center performance has historically focused on cost reduction activities based on agent productivity statistics such as First-Call Resolution, Average Handling Time, Speed of Answer and Cost per Call. While those metrics continue to be critical indicators of individual and center-wide performance, a new and more robust breed of performance-enhancing tools and concepts is rapidly emerging... To help you learn what these advancements mean to your operation, ICCM has brought together experts in the field of contact center and CRM topics along with the last technology providers. WITI Members: See the Discounts page in the Members Area for a free Guest Pass. Global leadership. World's largest online community. Security and safety online. This is just the beginning of what we've accomplished at AOL over the last two decades. Now we're preparing for our next 20 years. Join AOL and transform your potential into progression. Push the Internet to the next level for millions of members. Drive the content our members crave. Accelerate the future of Internet security and safety. Be first to the next communications breakthrough. Search for AOL jobs on WITI4Hire.